After you have applied for financial aid, visit MyFAU for updates from the Office of Student Financial Aid in regards to missing information, award offers and satisfactory academic progress. 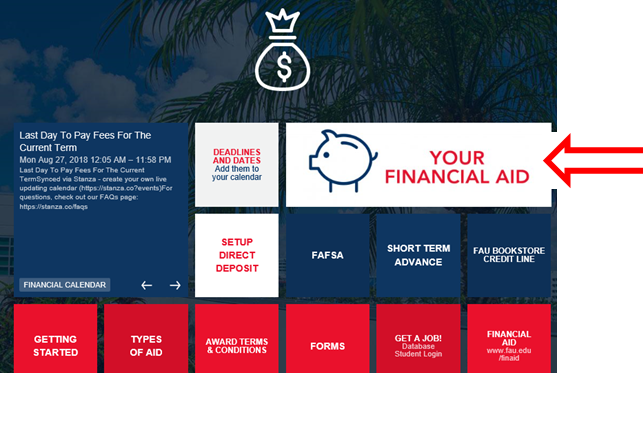 Step 1: Once you have logged in to MyFAU, click on the Money Matters tab. Click on "Your Financial Aid". 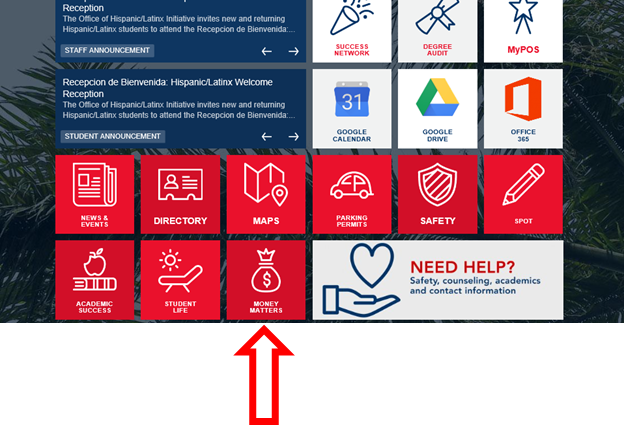 Step 2: From the Financial Aid main menu, click on the "Financial Aid Status" tile/box. Step 3: Select the Aid Year if prompted from the drop-down list. Step 5: Select the Aid Year if prompted from the drop-down list. Step 6: Click on the Accept Award Offer tab. Step 7: After clicking on the Accept Award Offer tab, click on accept or decline for each award listed. Click on the Fund Name of each award to display additional information regarding that particular fund. Step 8: Click on the "Submit Decision" button at the bottom of your award. When you receive financial aid, you agree to fulfill the Terms and Conditions of Financial Aid Awards . If you will not be attending FAU, please DECLINE all awards. If you do not decline awards, you will be fee liable for the courses in which you are enrolled. You may accept a partial amount of an award by entering the amount in the "Accept Partial Amount" field. Once you have made a decision on your award, no further updates can be made online. Adjustments to awards will require students to submit a revision form. In some cases, if you will be enrolled for only one term and the award offered is for more than one term, then an award revision request may be required to update the award (i.e. Seniors graduating in the Fall term). Financial Aid funds are disbursed after the drop/add deadline of each semester. Tuition and other charges posted to your student account will be deducted first. If a credit balance results, the student will receive a refund. Students are encouraged to sign-up for direct deposit.